This is another painting in my new series "Nooks and Crannies". This odd corner in the Phoenix Art Museum struck my eye. 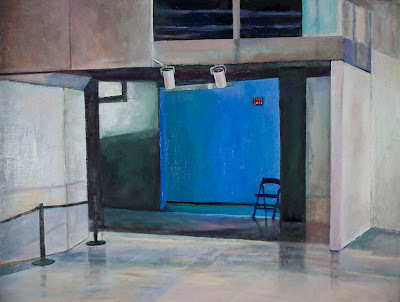 What attracted me was the radiant blue opening with the exit sign glowing and the empty chair, along with the reflections in the floor. To me, it is a mysterious and lonely spot. This week I'm helping a friend with a workshop and also giving a talk entitled "Magic, Drudgery and Technology" at the local library. In addition, I'm meeting with the teacher of Las Artes GED class to talk about resuming my weekly volunteer art classes with her group. That's why I called this blog Giving Back. Generally, I find that in doing something for friends or community, I get back more than I give. For example, this morning I spent some time with a group of quilters talking about space and different ways to give an illustion of space to a flat surface. It was great fun and so gratifying to share what I know with them. Yeah me!